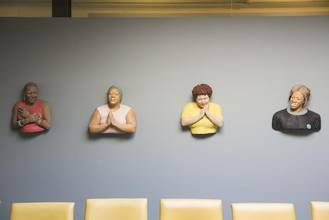 John Ahearn’s live cast sculptures of neighborhood figures honor local individuals and document New York’s vibrant, often undervalued, communities. In the early 1980s, Ahearn and other artists met weekly with residents of the Lenox Hill Neighborhood House on Manhattan’s Upper East Side to empower women through the creation of art. There, Ahearn met Ernestine, making a plaster cast of her that would come to form the 1992 work, Ernestine and Three Friends (Lenox Hill Neighborhood House Women’s Shelter). Whereas classical sculpture traditionally memorialize society’s elite—leaders, heroes, religious figures—Ahearn’s painted plaster casts acknowledge a diverse sampling of New York’s communities. They indelibly capture a life force that transcends social status, placing the real and unromanticized on a pedestal and challenging the notion that only a certain kind of individual is worthy of veneration. John Ahearn lifecasts people in a public context and creates sculpture/documents of the community. Ahearn began his career in 1979 at Fashion Moda in the South Bronx, and has since been an important contributor to public art both in the Bronx and internationally. For This Side of Paradise, Ahearn has collaborated with the local Headstart program, housed in the ground floor of the Andrew Freedman Home, and The Bronx Children´s Museum. He has been meeting regularly with the children to create plaster casts of the their hands to represent the community within the building today. After the exhibition, the most of the sculpture will stay with the Headstart program.